Dr. David McCarl has received certification in the treatment of obstructive sleep apnea (OSA). An estimated 18 million people in America suffer from obstructive sleep apnea – a serious condition characterized by pauses of breath and/or low breathing during sleep. Sleep apnea is an extraordinarily serious condition which can ultimately contribute to stroke, heart attack, high blood pressure, heart disease, depression, fatigue, and impotence. Snoring is a common side effect, and many people with sleep apnea are often not even aware that they have difficulty breathing. 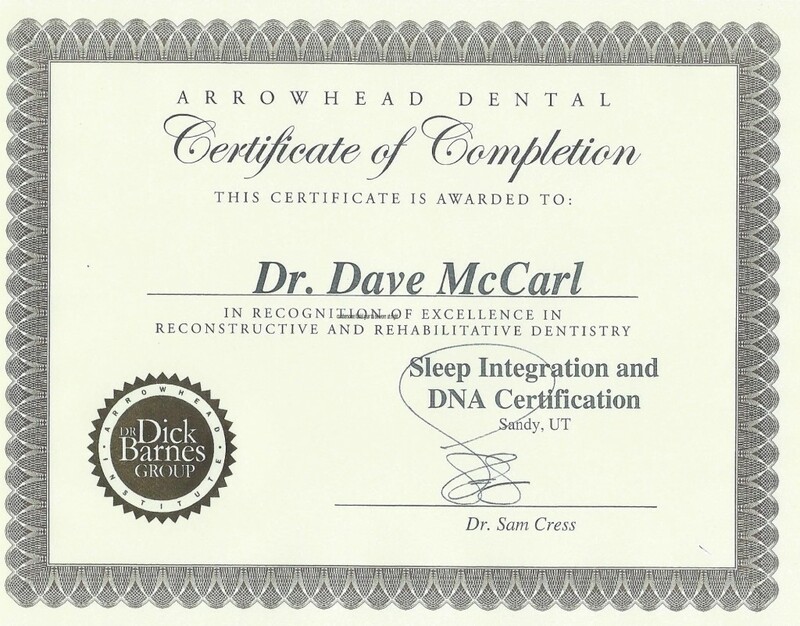 McCarl Dental Group is now offering the removable Daytime-Nighttime Appliance, or DNA Appliance, a comfortable and discrete treatment that can permanently correct causes of sleep apnea by moving structures of the jaw into a more natural position. The DNA appliance is new way to permanently correct sleep apnea and reduce snoring, straighten your teeth, and alleviate symptoms of TMJ disorder. The DNA Appliance works by widening the upper arch and the nasal passages, allowing more airflow to pass through. The lower arch can then move into an improved position. This sleep apnea treatment is now available with Dr. Dave McCarl at McCarl Dental Group in Millersville Maryland and Greenbelt Maryland. Contact Dr. McCarl today at our Millersville Maryland dental office 410-987-8800 or our Greenbelt Maryland dental office 301-474-4144 to find out more about the DNA Appliance and how it can help you. The DNA Appliance can help with sleep apnea without the need for drugs, surgery, or CPAP (a cumbersome facial gear to be worn at night to help patients control symptoms by keeping the airway open). The difference between the DNA Appliance and CPAP, is that while those treatments may help control symptoms, they typically only work while the device is being worn. The DNA Appliance works to permanently fix the causes of sleep apnea so that you won’t have to continuously wear uncomfortable gear while you sleep. The DNA Appliance also serves as an orthodontic appliance. It is designed to be worn at night during sleep. The DNA appliance works to help guide the growth of the jaw into a more desirable position, which can ultimately help improve teeth alignment. The DNA Appliance is very similar to a removable orthodontic retainer, and is usually effective in about half the time it takes for braces to work. It can also be very effective in children who need upper arch expansion. Question: The appliance is called DNA or Daytime-Nighttime Appliance. Are genes involved in the treatments? Answer: Yes, in the sense that the DNA appliance can upregulate or modulate gene expression during orthodontic, orthopedic and/or pneumopedic (non-surgical airway remodeling) airway treatments. However, no gene-transfer or artificial genes are used at all. Only the patient’s naturally-occurring genes are involved in this orthodontic treatment. The DNA appliances are involved in a system that has been specially-designed by Dr Singh to bioengineer craniofacial, dental, and airway structures so that natural developmental processes are evoked to enhance the teeth, jaws, TMJ, face and airway into more optimal relations for functions, such as sleep and breathing. The Daytime-Nighttime Appliance, or DNA treatment, is part of a specialty field of orthodontics called Epigenetic Orthodontics. This technique is designed to enhance the development and function of underlying jaw and nasal structures without using braces or facial “gear.” It can take much less time than other procedures, and has been proven to be very effective at treating sleep apnea, snoring and even TMJ disorder.